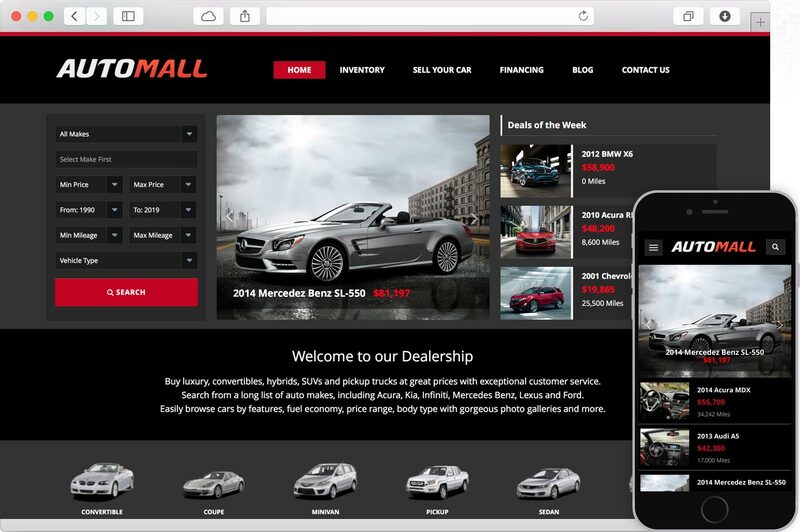 Professional WordPress Car Dealer theme solution with advanced features, Vin Decoder, schedule import-export inventory of feeds, lighting fast search and full mobile responsive design. Complete WordPress auto dealership theme solution with 'Pay Per Listing' module for selling ads via PayPal, monetize your website with Pay Per Listings module and get paid instantly via PayPal. 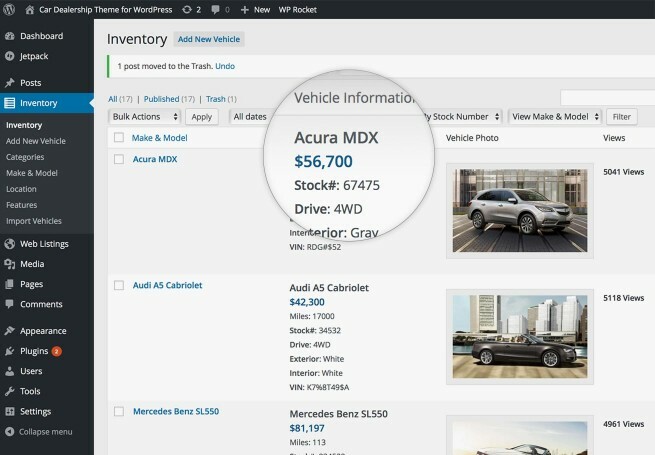 Select from more than 10 professional add-ons to extend the theme functionality, fromsearch vehicles by distance using your zip-code, VIN Decoder to easily pre-fill car data to CARFAX and NHTSA Safety Recalls reports to deep feed importing and exporting integration to automate your inventory listings together with free or paid car listing classifieds. Dealers can place the VIN and with a click of a button all information available about the vehicle will be pre-filled in the listing page, vehicle data is provided for any car in the American market. 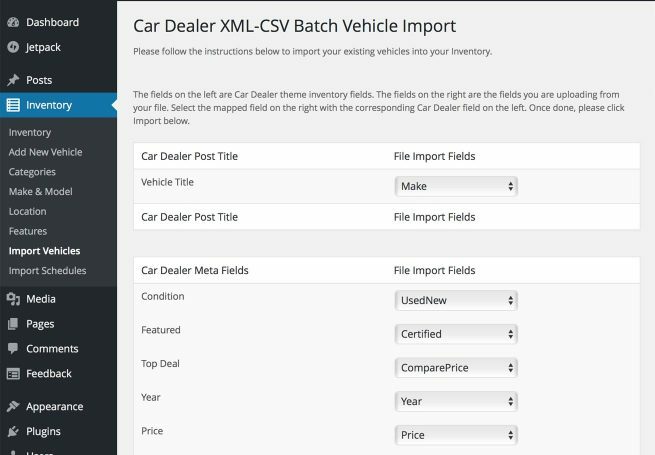 Batch XML and CSV importing of car listings, map your existing fields to the theme files and import your file and listing sin one click. Enter a VIN and pre-fill vehicle data ready to be published. 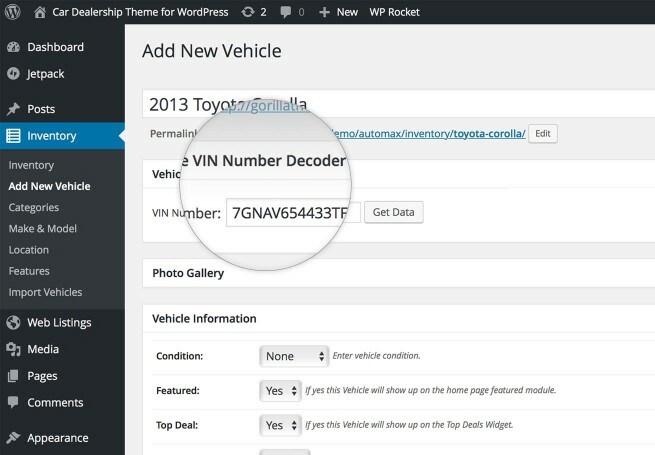 WordPress VIN Decoder add-on is the easiest way to add inventory vehicles at a click of a button in the Inventory administration module. Data is provided for any vehicle in the American market. Get paid by selling classified ads for car listings. Have you visitors submit their listings for a fee (or free) and monetize your existing website with the included PayPal integration module. Add your own global listing fee, customize messages and landing pages in your own dashboard. All listings are ready to be approved (optional) by the website administrator and accounts for your customers are created automatically at the time of submission. Input your location Zip Code and get results for car listings close to your location or select the amount of miles to search from a zip code to display all car listings within the mile radius. Search By Distance add-on is available on US and UK maps separately. Select up to 3 vehicles to compare side by side all vehicles specifications or saves as many vehicles as needed with a click of a button to inspect, share and preview on the extended single vehicle listing page. Create unlimited automatic scheduled imports with the included Schedule Inventory File Import. Select from a variety or options like hourly, twice a day, daily, and more options to schedule your import. Add your external CSV or XML file url and select import schedule. Only once map all external fields to AutoMax fields. Photos, data and all vehicle information will get imported in the scheduled times selected. 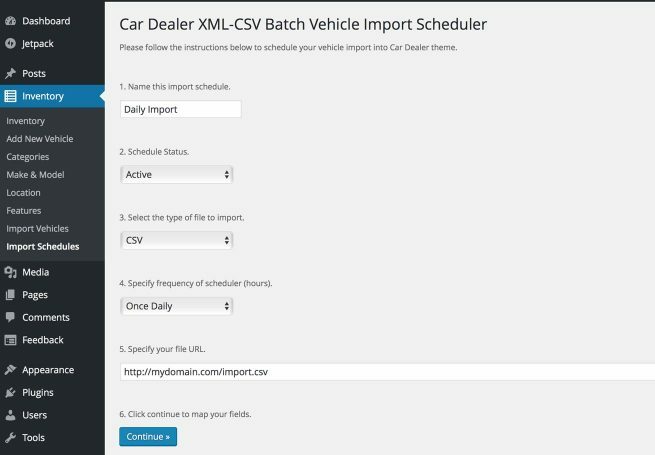 For one time import of XML or CSV files together with the Automatic Scheduler Import module AutoMax ships with an easy to manage CSV or XML file import to migrate your inventory to WordPress AutoMax theme in 3 easy steps. Upload your XML or CSV file. Map your previous inventory fields to AutoMax fields together with photos, categories and all vehicle information. 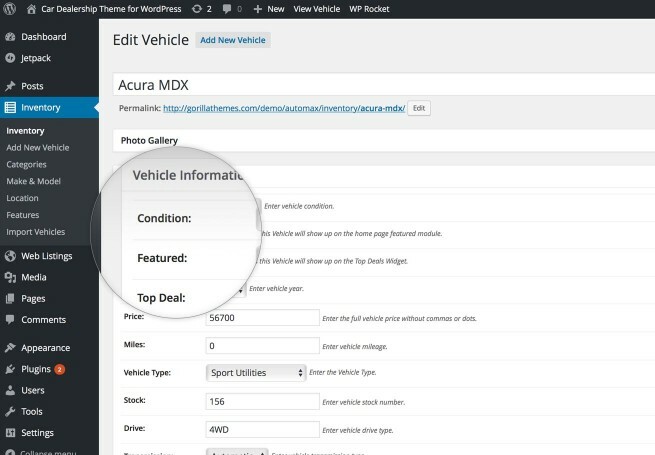 Full Dealership inventory access in one click from your WordPress dashboard, price, make-model, VIN number, vehicle photo and more information is provided in a list style layout for easy inventory search. 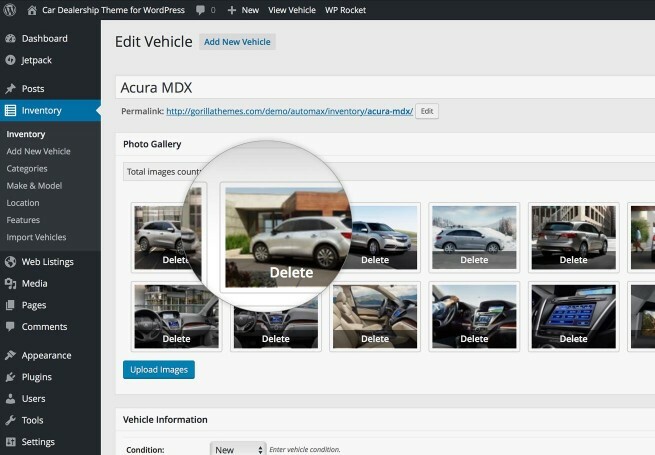 Delete, edit & preview your car listings right from the inventory module. Filter listings by Stock Number. Search by Make & Model. Bulk delete and edit of listings. Full vehicle information modules with condition, price, mileage, year, exterior color, interior color, vehicle type and much more are included in each listing. Use the labels provided out of the box or setup your own in the theme search fields setup module the WordPress dashboard administration. Add beautiful responsive photo galleries, upload batch images, publish, delete, re-order and edit photo information right from your listing editor, the theme will process, crop and resize your images to fit all modules. 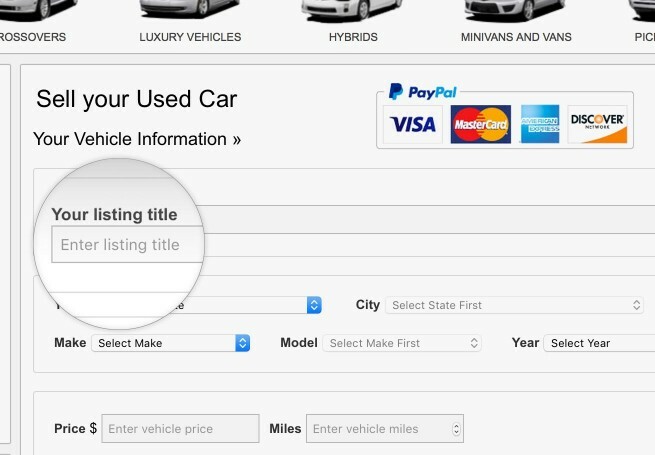 Add video to your individual car listings with the included Video ID Module, copy/paste a YouTube or Vimeo video ID and the video will show up in the features and overview tab on single listing page and formatted to fit your layout. Add your own labels and options in the search module section in your own language and translate the theme with the included PO files, English and Spanish languages are provided with the theme out of the box. General Business Phone, Currency and Metrics selector will allow you to display the theme on your own language metrics and currency symbols. 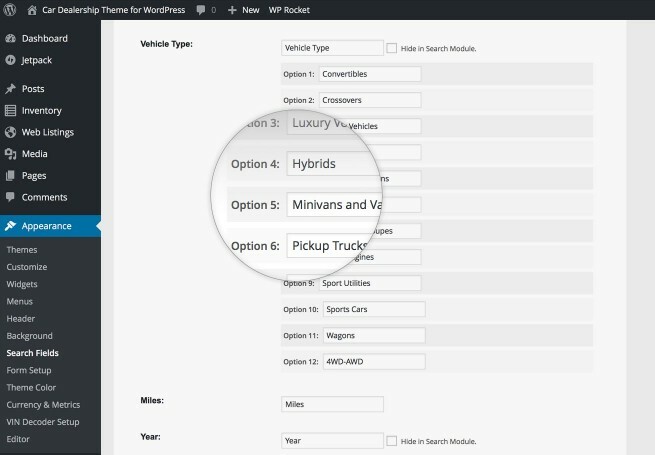 WordPress AutoMax theme widgets will give you the option to show and hide almost any part of the theme from your visitors and making AutoMax a very flexible theme to showcase your car listings. 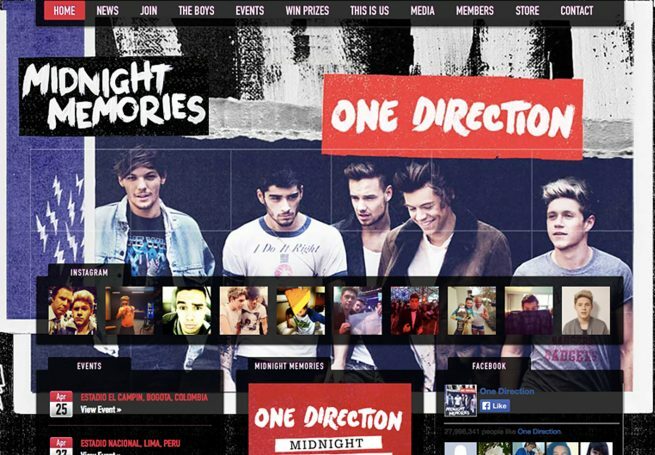 Theme support and full documentation is offered on all packages. Update to any package anytime.